Many telematics companies are making services available on smart phones. 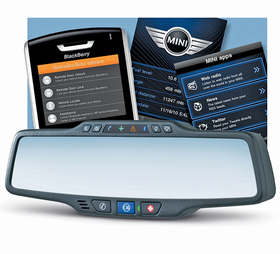 OnStar will be available via an aftermarket mirror. The word evokes such services as General Motors Co.'s OnStar: technology that is built into the car and uses live operators to, say, summon an ambulance after a wreck. But smart-phone technology is rapidly changing the very definition of telematics. All it takes is a smart phone to stream a rich menu of applications into the car, ranging from social-media sites to traffic alerts. So traditional telematics companies, such as OnStar, are exploring ways to bring the Internet into the car and, at the same time, looking for new lines of business, such as selling telematics-related products directly to consumers. The answer in many cases is to make the traditional services, which range from unlocking car doors to helping find a vehicle in a parking lot, available on a driver's smart phone. Besides OnStar, the big players in the world of built-in telematics are Hughes Telematics Inc., ATX Group and Sweden's WirelessCar. Those are the companies with the technology that runs automaker-installed systems such as Mercedes mbrace, Toyota Safety Connect, BMW Assist, Volvo On Call and the newest competitor, Hyundai Blue Link. Mercedes mbrace, developed by Hughes Telematics, debuted in 2009 with both built-in and smart-phone features. Besides being able to push a button to reach a call center, a Mercedes driver can control certain vehicle functions using a smart phone. Toyota offers traditional telematics through its Safety Connect and Lexus Enform products, developed by ATX. This month, the automaker announced it will provide a separate system called Entune, which will give drivers voice-controlled access to popular smart-phone applications, such as Internet radio, restaurant reservations and movie tickets. They will be streamed into the car from cell phones. OnStar offers some of its core services on cell phones. It also integrates Google Maps with OnStar's turn-by-turn navigation feature. But in one of the biggest changes to its business model, OnStar is moving into the aftermarket. It recently announced plans to sell an OnStar-equipped mirror that retailers can install in nearly any vehicle. Gartner Inc. analyst Thilo Koslowski called OnStar's move a "pre-emptive strike." He said other telematics companies will follow suit. Before the announcement last week that he is leaving GM to start a consulting firm, OnStar President Chris Preuss told Automotive News Europe sister publication Automotive Newsthat competition was one reason for OnStar's decision. "We could just hold our hands pat and let somebody else take that opportunity," Preuss said. "Or we could go after it." Hughes also has an aftermarket device, called In-Drive. It provides access to traditional telematics services but also can tap into onboard data, such as whether the car needs maintenance, how fast a driver has been going and the number of miles driven. One target customer: insurance companies that want to set their rates according to how people drive. The ability to track vehicle data and driving patterns is significant, said analyst Roger Lancot of Strategy Analytics. He said GM's use of OnStar vehicle diagnostics to steer drivers to their dealers' service departments "turns car ownership into an idiot-proof proposition." Also valuable is telematics companies' ability to detect crashes. Hughes is developing personal telematics devices, such as pendants and wristbands that can be used by elderly or disabled people to summon help. The same technology that detects a collision can detect when a person has fallen. Koslowski says he wouldn't be surprised to see other telematics providers, even OnStar, roll out such consumer devices. "Why not take that value proposition outside of the vehicle?" he asked. "To me, it makes a lot of sense."